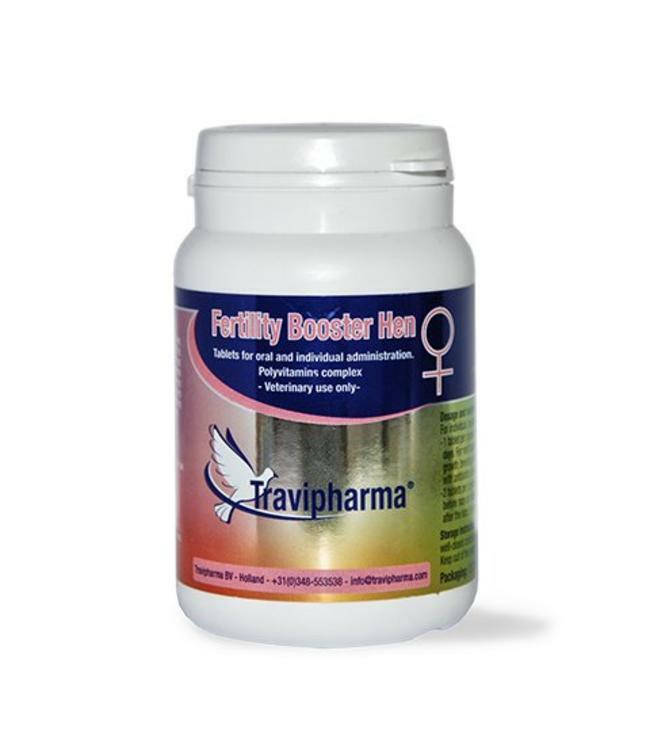 Fertility Booster Hen is a supportive product for an optimal condition during fertility in the breeding season. - Prevents fatigue and improves the bodies' resistance to stress. It has a positive effect during the growth period, breeding and moulding season or during the recovering period after treatment with antibiotics or ani-parasitic products. Each tablet contains (active substances): Vitamin A - 120 UI, Vit. D3- 6 UI, Vit. E- 0,197 mg, Vit. K3- 0,080 mg, Vit. C- 0,400 mg, Vit. B1 - 0,080 mg, Vit. B2 - 0,160 mg , Vit. B3- 0,600 mg, Vit. B5 - 0,240 mg, Vit. B6- 0,080 mg, Vit. B9- 0,0197 mg, Vit.